According to The Atlantic, new programs are aiming to encourage women to seek out welding careers and similar jobs. Samantha Farr, founder of the Detroit nonprofit Women Who Weld, is hoping to encourage more women to join this historically male-dominated field. Much of the current welding workforce is nearing retirement age. There is still plenty of welding to be done. Bridges, highways, oil pipelines, and much more projects require on-site and skilled welding. As of 2016, women only made up 4% of the welding workforce in the United States. In recent years, efforts to recruit women into the welding workforce was semi-successful. More women pursuing these careers can drastically help — Women Who Weld and similar organizations are hoping to achieve that. “The number of women has increased. So has the total workforce,” said Monica Pfarr, the executive director of the American Welding Society Foundation, a charitable organization focused on welding research and education. Farr has been asking women and industry leaders why women aren’t pursuing careers in the welding field. 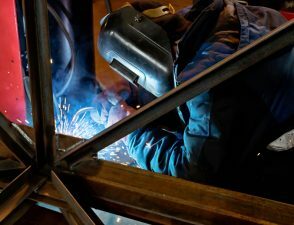 She found that a combination of factors, including socioeconomic issues, fear, lack of encouragement, and harassment in the workplace has mostly kept women away from welding. The National Association of Manufacturers has also launched the Manufacturing Institute. This is a nonprofit initiative aimed at highlighting the achievements of women in manufacturing (including welders) and to encourage mentorship for a new generation of female welders. How do you feel about women who weld? Let us know in the comments below.